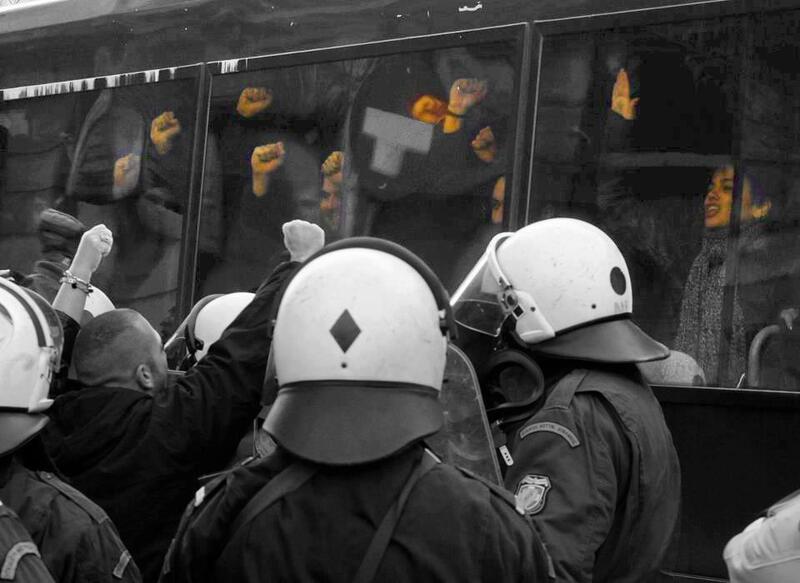 The battle against the eviction of squats in Greece heats up as more occupations are attacked and dozens arrested. There now seems little doubt that the Greek state is carrying out a sizeable and sustained assault on squats and the anarchists movement in general. In the last weeks as well as Villa Amalias, two other squats in central Athens have been attacked by police forces. This may just be the beginning of a bigger operation. A leaked report suggests that the Greek police are planning to attack 40 squats around the country. After the events of the last few days there also seems little doubt that should the police carry out this plan they will have to fight for every single building. The eviction of one of the oldest squats in Athens, Villa Amalias, on 20th December was the first strike. Soon after came a raid against another occupied building known as ASOEE. Next after the attempt to reoccupy Villa Amalias on the 9th January the police targeted the Skaramanga squat. A leaked police plan reported on mainstream Greek media suggests that the next stage of this assault would target up to 40 occupied buildings across Greece. The raid on Skaramanga was probably planned for a later date but brought forward as a retaliation for the reoccupation of Villa Amalias. Rather than isolated raids the events of the last week would seem to be part of a strategy of repression aimed directly against the anarchist movement in Greece. Throughout the years of social unrest unleashed by continuous rounds of harsh austerity measures ideas and actions of resistance have been increasing in Greece. Over the last months there has been a marked increase in repressive tactics against any section of society which could offer resistance. Workers on strike have been attacked, journalists reporting corruption have been arrested, anti-migrant sweeps have led to 60,000 detentions, and new weapons such as water cannon have been deployed. These latest attacks show the squats to be the next target for state repression. As soon as news spread about the occupation and the police attack more actions took place around the city. The offices of the governmental party DIMAR were briefly occupied in solidarity until it too was attacked leading to another 40 detentions. Protests then moved around the centre of Athens with police forces using tear gas to remove people from the finance ministry building. It was about this time that the Skarmanga squat was raided with another eight people being detained. Throughout the day there were protests, gatherings and assemblies in active support of the squats and those detained. By the end of the night police forces had invaded the neighbourhood of Exarchia which is regarded as something of an autonomous space. The total number of detentions came to around 150 which would mean this is the single biggest number of anarchists arrested in one day for 15 years. Many of these face charges including 92 from Villa Amalias who at the time of writing are still being held at the police headquarters. Posted on January 12, 2013, in Europe and tagged Economical Crisis, Evictions, Greece, Squatting. Bookmark the permalink. Leave a comment.